Fitted with a V8 (from a Mercedes AMG G63) engine or V12 (G65, tunable up to 1,500 horsepower) the Black Shark has all the juice it needs to get out of its own way. I mean, just barely. Besides B7-rated armor (the highest for bullet resistance) this truck is lugging around a "military-sourced sniper-prevention roof, road-analyzer, distance explosive detector, and signal jammer... Along with champagne holder, sterling silver hand polished flutes, golden shisha and bespoke humidor, Xbox ONE, Playstation 4 and an LTE hotspot." 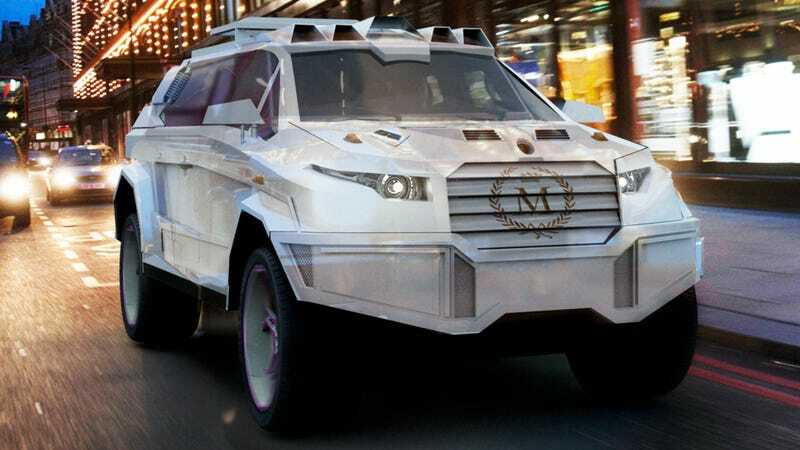 I don't know guys, this sounds a lot more like a Bond villain car than a hero spymobile. DARTZ made a decision not to declare price tag, to avoid situation when cheap Bugatti owner feel himself like a beggar... therefore DARTZ just will inform price tag as: Six Zeros, or 6Z. Unit-specific price on request. Our car is based on 3 (non-lethal) bullets. Russian Imperial opulence in the interior, Soviet military power in armoring and German engineering perfection as a platform. The first one traces back to the year of 1869 when the Russo-Baltic Wagon Factory was founded in Riga, then a major industrial center of the Russian Empire. Originally the new company was a subsidiary of the Van der Zypen & Charlier company in Cologne-Deutz, Germany. In 1894 the majority of its shares were sold to investors inRiga and St. Petersburg, among them L. Tetelbaum, current owner's Leonard F. Yankelovich's direct ancestor. The company grew to 3,800 employees. The second bullet and turning point came in 1912 (then Russian Empire), when the company became official Russian army's supplier with the first armored car built in Riga in 1914 on the base of Russo Baltmodel C base. The technology was eventually used in the upcoming decades as the foundation for armoring luxury coaches for the Soviet union's leaders and officials.One of company's branches - BTAZ, has detached itself, and is building spaceships right now. As the modern technology developed over the century, we have decided to use world's most sophisticated technologies as the car's platform - Mercedes Benz AMG. Engineering perfection for the engine, transmission, suspension and chassis. Our third bullet. Try to dodge these.